Shopping for the man in your life can be challenging so we have selected some mens tweed & traditional gifts which are stylish and fits his modern lifestyle. Shop our stylish collections - amongst them; Pocket Watches, Hip Flasks, Shooting Sticks, Silk Cravats, ideal for business or pleasure. The Celtic Tweeds collection of presents for men offers tasteful pieces for the discerning gentleman, the perfect match our selection of men's tweed jackets & waistcoats. Celtic Tweeds selection of traditional presents for men reflect our beliefs; beautiful craftsmanship in every stitch and button sewn. Effortlessly stylish, contemporary & perfect for the modern man, our gifts embrace style with our love for exquisite tailoring. 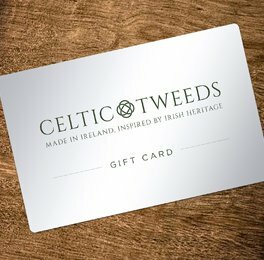 Completely unique with traditional craftsmanship at Celtic Tweeds, our selection of gifts are perfect for the fashionable man. We’re confident you will find something he’ll love, with stylish accessories and gifts which are truly a perfect match for the discerning man.